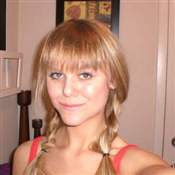 This is Stacey Zegers from London, Ontario. Stacey is a musician who loves country music. Recently I discovered her profile on myspace.com and I thought that her music is really good. Stacey entered a contest on CMT.ca the website of the country music tv station. The contest is called "Casting Call" to find a new host for a summer job at CMT. So far, she has made it into the top 16 picks and the voting is still going on to get to the top 5 and then down to the one! To vote for her, you can go to www.cmt.ca and click on casting call and then click on vote, then select her picture from the 16 finalists and then select vote. You can vote as many times as you wish. The reason I am voting for Stacey is because, she is from London, Ontario only an hour east of Sarnia where I live. She is also the only finalist is our area. Vote for Stacey and hopefully she will make all the way to the number one spot as the new host on CMT. If you live in Sarnia, then you will be able to see Stacey perform at an upcoming concert at "The Stubborn Mule" in June. Cheers Everyone! Happy May 24 Weekend!